Thomas Kolding was spotted at various train stations after he went missing from Mountain Lakes, New Jersey, on Oct. 30, 2018. A 15-year-old New Jersey boy who left his family the night before Halloween has been found safe in Philadelphia, according to authorities. Thomas Kolding went missing from his family's Mountain Lakes home on Oct. 30, carrying only about $1,000 in cash and some personal belongings. The teen reportedly had an argument with his father about his grades, according to NorthJersey.com. 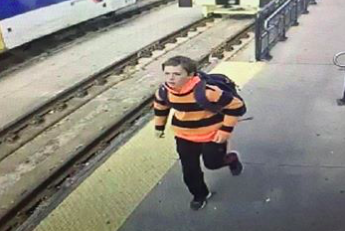 The boy was later spotted in various locations across the region, including Newark's Broad Street Station, New York's Penn Station and Camden's Walter Rand Transportation Center. Authorities in Morris County launched an extensive search for Kolding as word of his disappearance spread on social media. Police confirmed Kolding was located Tuesday afternoon near the Penrose Plaza Shopping Center in Southwest Philadelphia. Authorities shot down initial reports that Kolding was in a "tent city." Prosecutors also thanked the police in Miami Township, Ohio for their assistance in the investigation, along with several other law enforcement agencies.